Electricity is my new favorite seasoning. 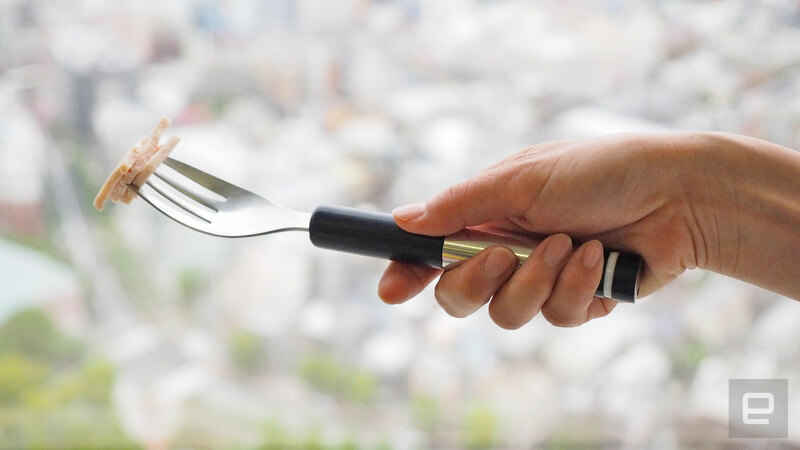 This prototype fork can help you eat less salt and could save lives. It sends a gentle electric current to your tongue as you eat, fooling tastebuds into experiencing a salty, (sometimes sour) taste -- even when there's little to no salt in the food itself. Despite the awkward notion of willingly putting an electric current into your mouth, the "electro-fork" can potentially tackle some legitimate health issues. According to the World Health Organization, we consume 10 grams of salt a day -- double the amount it recommends. This increases one's chances of hypertension, heart disease, strokes and more. So, in the interest of my health (and morbid curiosity), I went for a taste test. The fork isn't particularly high-tech, with the parts costing less than $20 total, including a battery to power it. At the base, there's a dial allowing you to toggle between three intensity levels. At the prototype stage, there's remit here for a greater range of sensations, but even so, three settings are enough for my uneducated palate. There's definitely a "your mileage may vary" caveat here, because even without electric cutlery, what's salty for one person might seem barely seasoned to someone else. The metallic handle is a necessity. To complete the circuit for the fork, you need to strongly grip it while depressing a button closer to the fork head. It means you have to hold it kind of like a shovel, which makes things slower. It's awkward to grip, and the button is in the wrong place. If or when the device gets a redesign, I hope the company puts the button on the side of the fork. If development continues, the device should hopefully get even slimmer. The team behind the project says it's also looking into metal chopsticks if the technology can be made to fit such a narrow device. According to tests so far, one of the biggest challenges is getting diners to put something with an electric current in their mouth. Me? I had no such problem. The fork (or whatever utensil the tech goes inside) isn't a solution just by itself. For anyone with hypertension or other conditions that require little or no salt in their diet, you have to start with no-salt food. The fork -- and the current it carries -- merely helps substitute for the salty deliciousness your taste buds are missing. When its inventor, Hiromi Nakamura, began her research around six years ago, it was aimed at augmenting or changing taste with electric current. The health angle only became obvious later, adding a more serious reason to continue the project. Researchers have teamed up with a clinic that is helping to test the fork with those who would benefit from consuming less salt. (However, given the small amounts of electricity involved, it's not recommended for anyone who's pregnant or has a pacemaker.) According to tests, one of the biggest challenges is getting diners to put something with an electric current in their mouth. Me? I had no such problem. 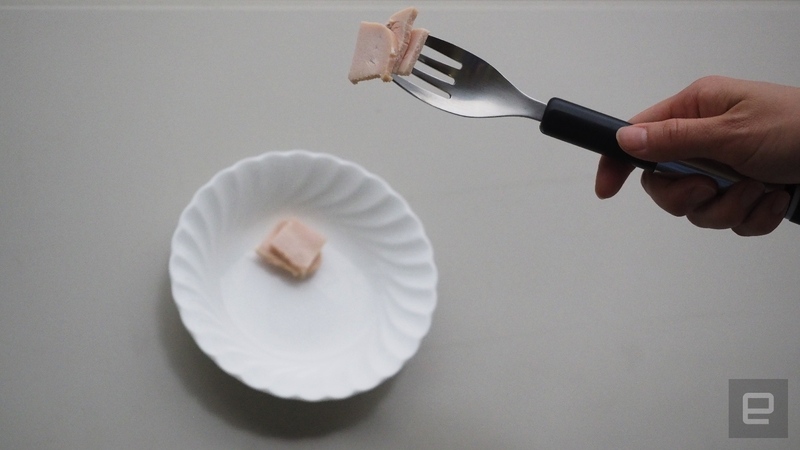 I sat down to eat chicken breast and fish sausage. It's not a perfect test because both contained some salt to begin with, but even at the lowest "level" on the fork, the charge added a sharpness and strength to the taste. Aside from holding the fork like maniac, you have to ensure that the fork connects with your tongue to complete the taste circuit. It's another weird quirk to the eating experience. Unfortunately, I didn't get to sample foods with zero salt, but the salty sensation is there when I put the fork in my mouth without any food. (Of course I did such a thing.) Naturally, there's that metallic taste that comes with doing so, and the utensil also helps add a certain sourness to cuisine. The team has already arranged several short-term "no-salt restaurant" pop-ups to demonstrate the fork. The menu offered items you'd actually want to eat -- pork cutlet, curry and even a desert -- except they were prepared with little to no salt. In fact, researchers have developed hundreds of no-salt recipes for foods that usually contain it. Garlic, ginger and pepper also enhanced flavor when there's no savory NaCl to assist. While testing continues, there will be more pop-ups, and, as the creative team at J. Walter Thompson explained to me, while it isn't demonstrating the fork outside Japan yet, excess sodium consumption is definitely a global problem: New York City has had its own salt-reduction initiative since 2010, while in India high sodium is the cause of over one-quarter of all deaths by disease. It's early days, but the electro fork could help.